Beautiful, well groomed nails enhance your overall appearance, and are a vital part of stating who you are in both your social and business life. But it can take a lot of time and effort to keep them looking perfectly manicured, and many women constantly worry about their splitting, brittle nails. And most of the time, women who take a pride in their appearance crave the regular hand massages, manicures and nail beauty routines the movie stars indulge in . . . The only problem is it can be very costly to coax your nails into a better condition. So unless some generous soul gives you a voucher for half a dozen manicures at your local nail spa, we will have to find another, less costly way to pamper those hard-working pinkies. 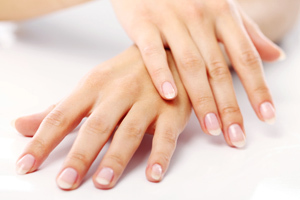 There are several way you can use aromatherapy treatments for beautiful nails. In the world of aromatherapy all things are possible . . .
First, some common sense tips. Always protect your hands and nails from hot water by using rubber gloves, and above all else avoid harsh chemicals and abrasive cleaners that can damage the nail plate. Continual damage from chemicals can lead to onycholysis – separation of the natural nail plate from the nail bed which lies underneath. Always remove your nail polish with a mild, acetone-free remover since acetone can strip the delicate layers of your nails. If you have sore skin around the nails avoid using nail varnish that contains formaldehyde since this is harsh to nails and skin. Add 1 drop of tea tree to 5mls of carrier oil or a base cream and gently massage the damaged skin to prevent infection. There are several carrier oils that are commonly used in aromatherapy that are just perfect for moisturising dry, cracked, brittle and splitting nails. Whilst treating out-of-condition nails over the years, I have discovered several carrier oils used in aromatherapy that can bring about a miraculous improvement in their condition. Carrier oils such as avocado (unrefined), borage, coconut, jojoba, macadamia, rosehip and wheatgerm oils are all ideal for this purpose due to their highly effective softening and moisturising properties. Aromatherapy base creams can also be used to moisturise your nails, and ones containing any of the vegetable oils above should be your first choice. Simply choose one of your carrier oils from this list and gently massage a few drops into your nails every day, paying particular attention to the cuticles. This simple tip will help to keep your nails flexible, and the surrounding skin in good condition – providing of course that you repeat the treatment religiously. Like many beauty treatments, the real secret to success lies in maintaining a regular treatment regime. Persistence always pays off. If your nails are really in a bad way and in need of a more dynamic treatment, then add some essential oils to a carrier oil, base cream or base lotion and they will truly work their wonders on your damaged digits. Essential oils such as elemi, frankincense, galbanum, lavender, lemon and myrrh will all give a boost to damaged nails when used as part of your regular treatment routine. 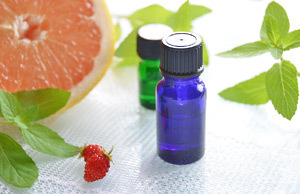 You only need to add 1 drop of essential oil to 5ml of your chosen aromatherapy carrier oil base for this purpose. You can make a very effective synergy containing just 1 drop of myrrh and 1 drop of elemi essential oils mixed into jojoba carrier oil. Another very effective blend is 1 drop of Frankincense and 1 drop of Myrrh essential oil blended into sweet almond carrier oil. 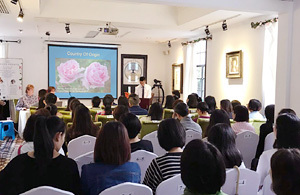 During 27 years of treatments in my clinic I have found these essential oils to consistently produce the very best results with my clients, and hopefully they will work for you too. To help prevent splitting, chipping and breaking nails, you should use this intensive aromatherapy treatment at least twice a week. Many of my clients like to also add the essential oils to a cream base so they can apply it several times during the day without getting their hands oily, and this is really the best way to get great results. Regular use of this simple routine will bring surprising results to your troublesome nails, helping to actually strengthen them over time. Of course you must make sure that you are eating a balanced diet to ensure you are getting enough vitamins and minerals. Here’s a simple but highly effective way to revitalize your nails. Soak your nails for about 5 minutes in a bowl of warm water to which you have added 2 slices of lemon or 1 drop of lemon essential oil. This softens the nails and makes them more porous in readiness for massaging your nails and cuticles. After 5 minutes, dry your hands and apply a small amount of the blend that you made to each nail, massaging in small circular movements over the nail and surrounding skin. Once the oil or cream has been completely absorbed, use a cotton-bud to gently ease back the cuticles and reveal the ‘moon’ on each nail, more correctly known as the lanula. Never use a metal instrument to push back the cuticle because metal can scrape away the protective cells on the nails surface. Don’t apply too much pressure to your cuticles during this part of the process, just gently ease them back a little with the cotton-bud. Use this revitalizing treatment at least twice a week until your nails have visibly improved in condition, after which you can cut the treatment back to once a week. It may seem like a bit of a chore at first, but believe me, the results are well worth the extra effort because your nails really are the highlight of your hands. Our nails are made of the same hard material as our hair; keratin, which is a protein. And although keratin is quite tough and resists most environmental stresses, just like hair it can be damaged by alkaline conditions and excessive heat. The keratin in nails is hardest at a slightly acid pH and many alkaline detergents, soaps and cleaners may loosen the fibres in keratin proteins that form the nail. 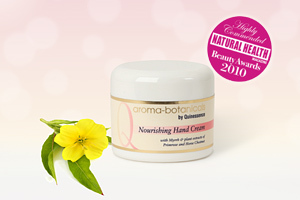 If you prefer a ready-made nail treatment, try our Nourishing Hand Cream from the Quinessence Aroma-botanicals range. Voted ‘Highly Commended’ in the esteemed Natural Health Beauty Awards 2010, this rich hand treatment cream is packed with oils of Coconut, Myrrh and Elemi, plus soothing botanicals of Primrose and Horse Chestnut. This nutrient rich combination promotes smooth, supple hands and nails, providing high performance protection against the aggressive winter environment. Soak your nails for up to 5 minutes, and then thoroughly dry you hands and nails. Next, massage your reviving aromatherapy nail treatment gently into your nails and cuticles.